When you enable permalinks in WordPress, you’re basically converting a link to an article you’ve written from something like krypted.com/page=2 to something like krypted.com/mac-os-x-server. Doing so makes Google like the page more (supposedly). After my site moved, the permalinks were broken, so I turned them off until I could find time to fix them. I never did. But thanks to the glory that is @sacrilicious the permalinks were magically fixed one day. So do permalinks matter to drive traffic to a site? Well, nothing else changed, same length of articles, same frequency, etc. 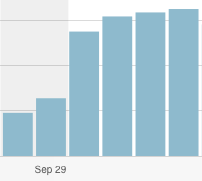 But when permalinks were turned back on, the answer was in my Site Stats, courtesy of JetPack: Thanks again, Banks!